Hugo Sperrle, Commander-in-Chief West, 1940. Hugo Sperrle was a German field marshal of the Luftwaffe during World War II. His forces were deployed solely on the Western Front and the Mediterranean throughout the war. By 1944 he had become Supreme Commander of the Luftwaffe in the West. It is often tempting to ascribe personality traits to people on the basis of their photographs and this can of course at times be very misleading. However, in this picture, Sperrle does look like a determined man and not one to be trifled with. Contrast this photograph with the one of him taken during his war-crimes trial. Sperrle joined the German army in 1903 and flew combat aircraft in World War I. In 1936–37 Sperrle led the Condor Legion, the German air force unit that fought on the side of the Nationalists in the Spanish Civil War. There his forces were responsible for the bombing of Guernica and other Spanish towns. In 1938 he was made commander of one of the Luftwaffe’s four air fleets, Air Fleet 3 (based in Munich). He led this fleet in the campaign against France (May–June 1940), and that July he was made a General field marshal of the Luftwaffe. Before operations began against Great Britain, Sperrle engaged in a heated debate with the other Luftwaffe commanders, particularly with its Supreme Commander Hermann Göring, arguing for a continuation of the attack on British airfields and the Royal Air Force to ensure a successful invasion of Britain. 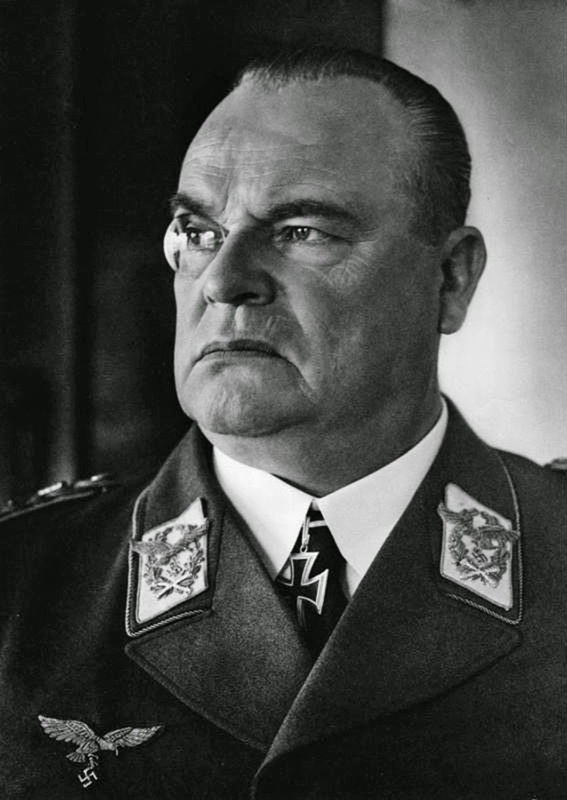 However, Göring ordered a change in the Luftwaffe strategy, switching to assault the British cities (which had the unintended effect of relieving German pressure upon the RAF). Before the Allied Invasion of Normandy, his forces were badly hampered due to a massive lack of aircraft, of experienced crews, and of fuel. At D-Day he had only 319 operational aircraft left to face the Allied armada of over 9,000 planes. Due to the subsequent inability of his units to thwart the Allied landings, he was dismissed from command in August 1944. 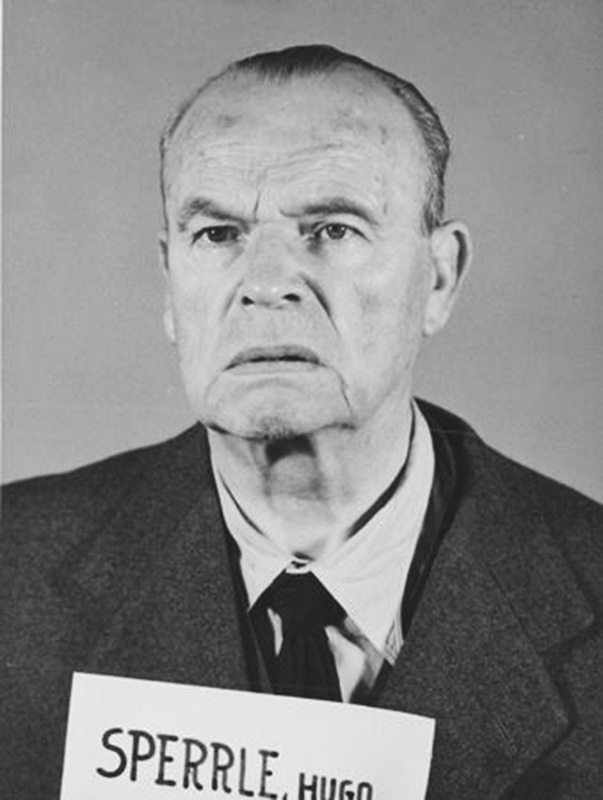 Hugo Sperrle during his War Crimes Trial. Field Marshal Sperrle was captured by the Allies and charged with war crimes in the High Command Trial at the Subsequent Nuremberg Trials but was acquitted. In the trial mugshot picture one gets a feeling for “how the great are fallen”, in that Sperrle now looks like a desperate and shabbily dressed man, a far cry from his days of power and influence as Commander-in-Chief West during the war. After the war he lived quietly and died in Munich in 1953.